Welcome to our News and Update Page. We are pleased to introduce new Canadian "Grand Champion" Rootn Polarexpress by Chewbacca"
Rodger is Canada's is No. 1 Bull Terrier for 2017 and 2018. Introducing our New Aust Champion Chewbacca Going Vertical "Eddy"
Congratulations to Lynn and Terrena on their new Canadian Champion Rootn Polarexpress by Chewbacca. Congrats Eddy on your first champion son. Canadian Ch Chewbacca Rootndownunder "Ned"
Pictured after winning the Open Dog Class under Speciality Judge Dr Carl Pew at the BTCA National Speciality Show 18/10/09 in San Jose. Congratulations to Ned, Lori and Terrena. 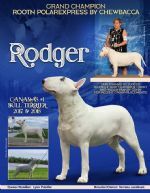 MBISS AM/CDN Ch Lonestar Whole Lota Hoopla, ROM. 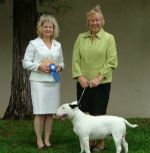 Being awarded the BTCA Stud Dog Emeritus 2009.